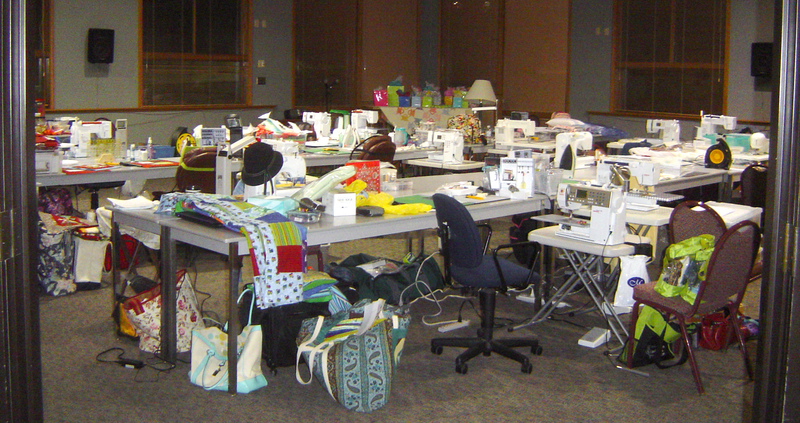 I have been busy on the weekends preparing for my now ‘annual’ Arkansas quilting retreat. With an online swap group that doesn’t really talk anymore, and doesn’t really swap anymore either. But the ladies have been coming for many years and now I have been coming since 2010. A little sad because the fall’s fearless leader passed away late last fall/winter. And it will be hard to imagine the retreat w/o her spirit. But also happy to reconnect with some of the other quilters I have gotten to know over the years. To prepare I made my own style of pincushion & thread catcher bag. This doesn’t have stabilizer like I had planned, but oh well it’s just a pincushion bag. The pincushion is an offset square pincushion. The name for the pincushion shape is Biscornu and is traditionally done with pretty embroidery/cross stitch patterns on the top. 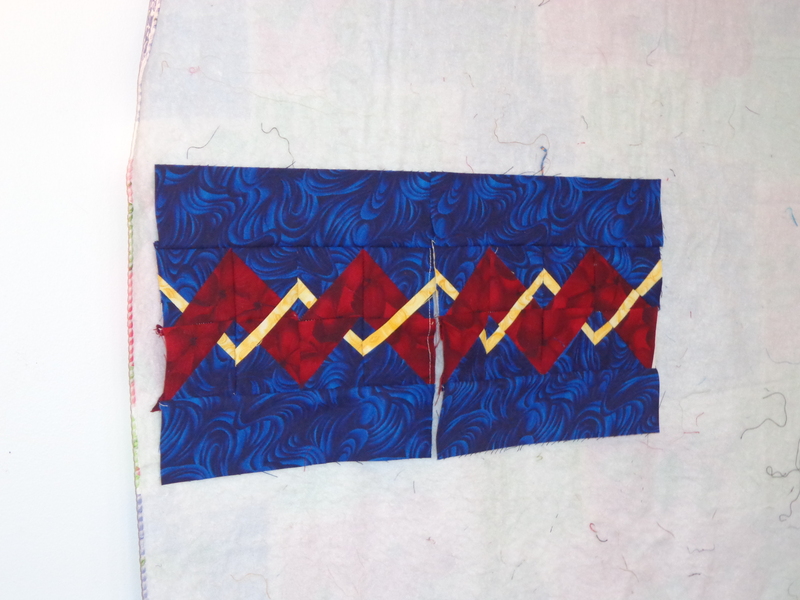 I used two 5 inch offset squares to make the pincushion. I stuffed it with walnut shells. Then went searching around all of creation (aka Kansas city quilt/fabric shops) for the perfect button for the top. I think the resulting button is from Joanns, the last place on my list that day. I used the tutorial from Merriment Design for the basic bag, self modifying the size of the liner material & outside bag, in addition to adding the Velcro strip to the bag and base. The base is actually a small square of wood, covered with batting, sewn with a cover (also made with two 5 inch squares). This would work a tiny bit better with stiff stablilizer sewn just under the top rim of the outside lining. The Biscornu pincushion sits on the top and provides the weight for the combo even though the actual pincushion is not attached. For retreat I am going to start ‘two’ new quilts. One I wanted to try to start last year but didn’t like the color values / amount of fabric I had for the color. I am going to retry to start this project up again. I also am planning to sew the final quilt top together on the hexadaisy plus quilt, the larger, slightly modified version of the small hexadaisy quilt I started this spring. I have two bindings to attach, one from the strip twist swap blocks from way back in 2010 or so. This was my first long arm quilt that I only got 3/4 of the way through, and as you can see ‘ol’ blue worked its way to finish the rest of the quilt. The last section of quilting is not exactly to my liking or standard of the long arm stuff, but at least it is done & just needs a binding. And a few blocks here & there to work on as leaders / enders – a black version & a white based version. I had desires to make a twister block pattern I purchased this year, but didn’t have enough fabric for the quilt I wanted to make, even the special dyed fabric I bought for it. 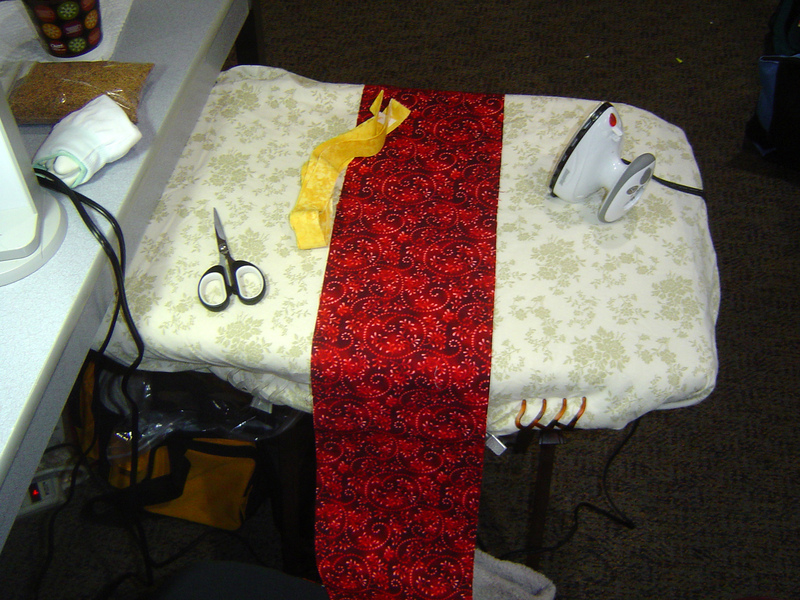 So that fabric will be repurposed and some other time I will make the twister block quilt. But then this morning (hours before retreat mind you) I was trolling around my own pinterest board this morning & came up with a new variation of a design I have been wanting to do since 2010, a God’s Eye quilt. 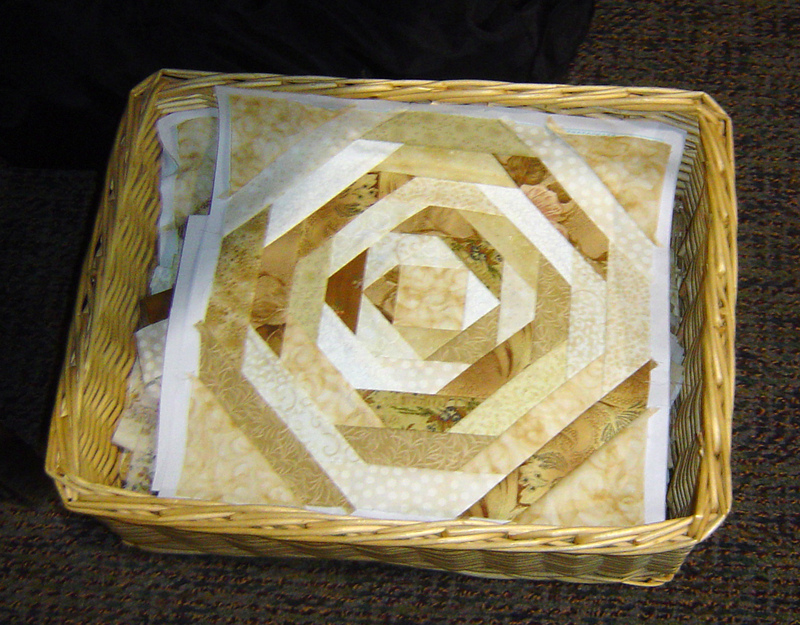 Quilters cache has detailed instructions for doing a 20″ God’s Eye block. 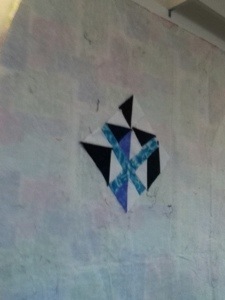 I had seen the block done w/ HST’s in my 1000 quilt blocks book a long time ago. So a short time later in EQ7, I created the god’s eye (didn’t see it in the library) & a good alternate block. If the quilt works out, I’ll consider writing up a pattern for this with HST’s. The God’s Eye block has a lot of parts to it, but I like it. I know it reminds me of the trumpet block for my Exothermic wonders quilt, but I love the play of these two block sets together. And with that, I have to commence packing. 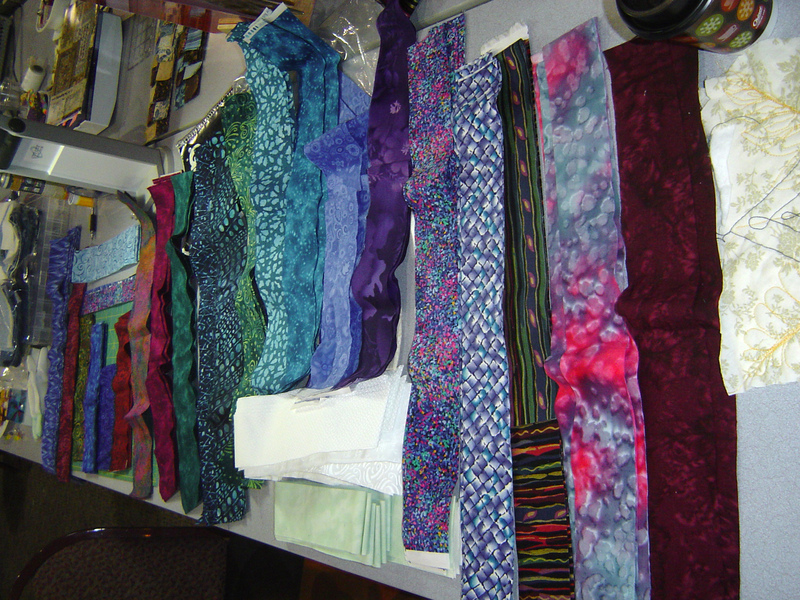 What’s left is all the extra parts I will need to create these wonderful quilts. Glad I was able to create the idea for something new. As I was posing the question about what to take on retreat, I was hit by a question out of the blue about retreats on my Facebook wall. I was happy to see that many different answers to the question, what do you advise a retreat newbie provided three answers to my questions. 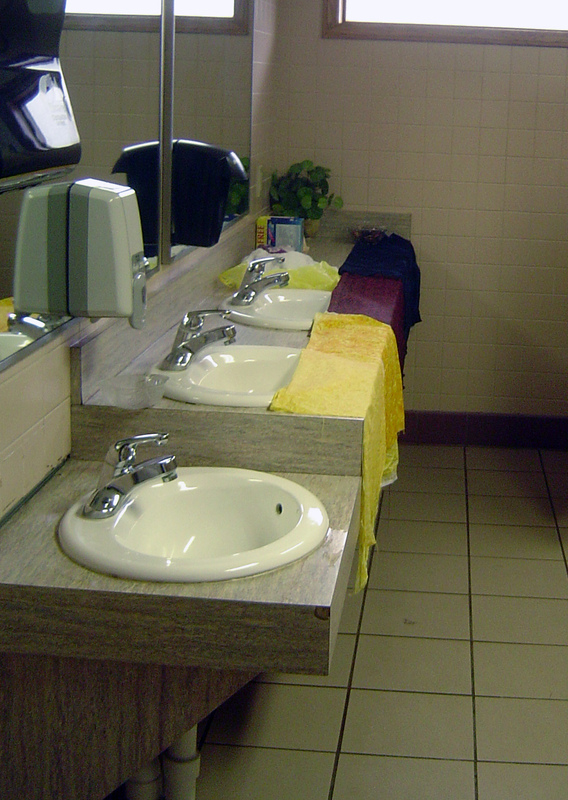 First, bring things for personal comfort, such as food, fuzzy socks etc. In the longest section I discuss what it was like to be at my current retreat. 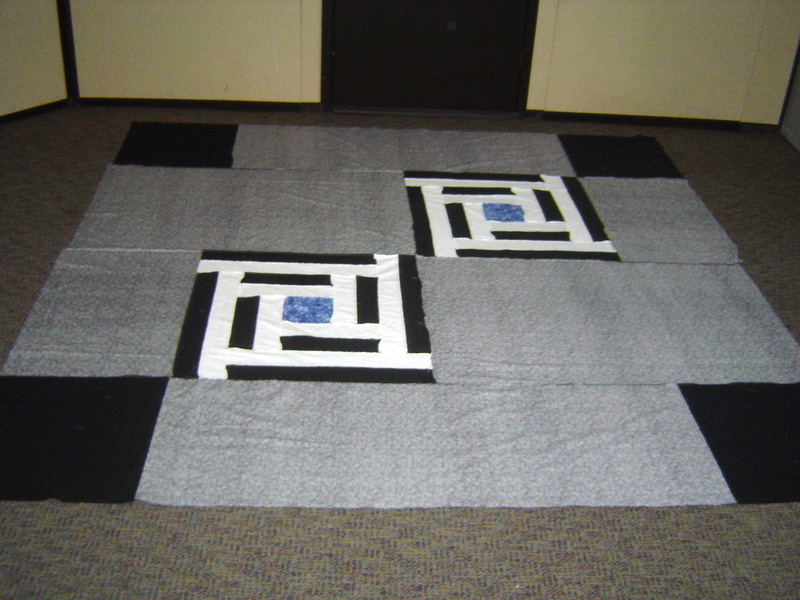 The biggest quilt was the samurai sudoku quilt top center finish. Next was helping the near 10 year old with designing and sewing this block. After the samurai was taken care of, I worked on these two blocks and made parts for more blocks. And you can see the difference in the blocks and their construction. 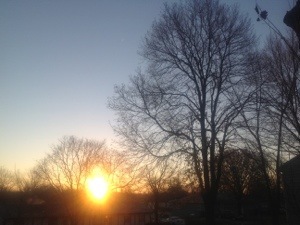 And here’s the chilly pre-thanksgiving view from my porch this morning, testing out a camera option. Luckily it will get nice and toasty today. That’s all for now. Look for BFSI quick post. Use this podcast and my experiences of two different retreats as a guide to what types of things you may want to bring with you to retreats, or suggestions on retreat projects. My last post has my basket weave quilt picture. 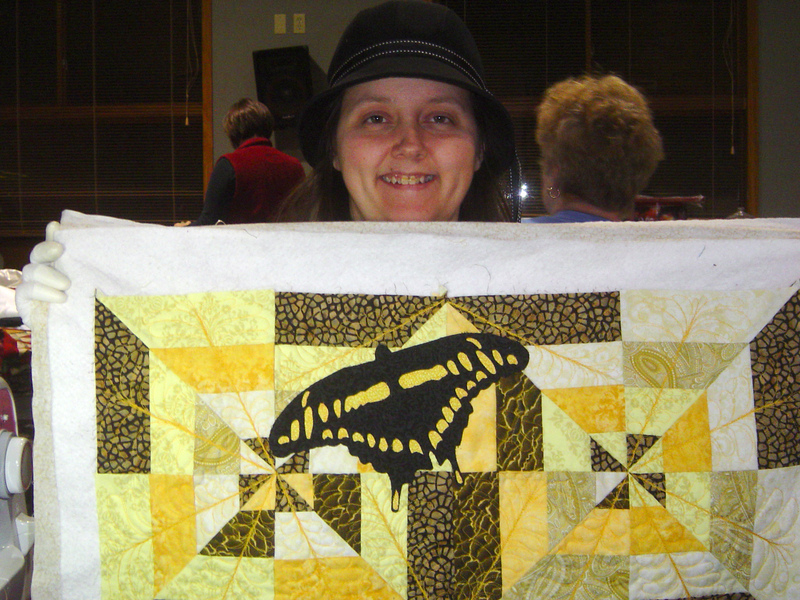 Here is my butterfly quilt with free motion quilted feathers in it. Here is the cutest ironing board ever (not mine, but I wish). 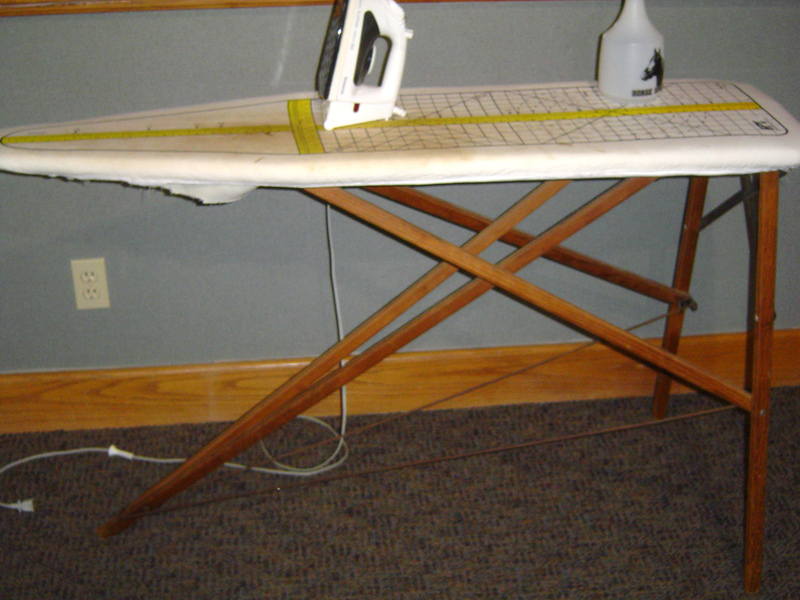 Here is my personal ironing surface solution. The pineapple block that I was using littlefoot paper piecing method for. See my new facebook page. The link doesn’t appear to be working for some reason, but if you’re interested, search on facebook for the Scientific Quilter and like my page. And if anyone else has more luck with this, and would like to know what I am missing, please let me know too! Thanks for my commenters and encouragement!